Gerard Farrés sustained a crash just 25 kilómeters away from the special’s finish line, causing him to lose all his fuel, but manages to stay in the race and solidify his fifth position as the best Spanish motorcycle rider in his final Dakar. Dani Oliveras caps off his performance by sneaking into the Top 10 overall. Marc Solà painfully manages to put himself among the 20 best. January 19th, 2018 – Cordoba (Argentina). The penultimate stage of the toughest rally in the world was called to be the last chance for the candidates to attack their rivals for a decent chance at gaining time. A seemingly transitionary stage after the countless kilometers and difficulties that have been endured this year by the riders, turned out to be another long day with more than 900 kilometers (424 of them making up the two special stages) where the unknown variables in the standings were clarified, and little was left to solve for the final stage in Cordoba. Gerard Farrés knew that the cancellation of the stage of Fiambalá took down most of his chances of gettinig on the podium, because without complicated navigation and on fast tracks, the official bikes had a clear advantage. That’s why the Catalan did not go crazy, he chose a tire that would safely make it through the stage to avoid the extra risk, but still rode to his fullest potential. In the first part of the race he rode with Aubert and the dust slowed him down slightly. Farrés spent the entire day in the top six, until he reached the last stretch, where he suffered a crash, damaged the tank and lost all his gasoline. Luckily, he managed to get some fuel from a spectator’s car to be able to continue in the race and get to Córdoba, although all this made him lose several minutes. Consequently, Gerard gives up a position to Antoine Meo, but ensures his position in the Top 5 at Cordoba as the best Spanish rider on a motorcycle. 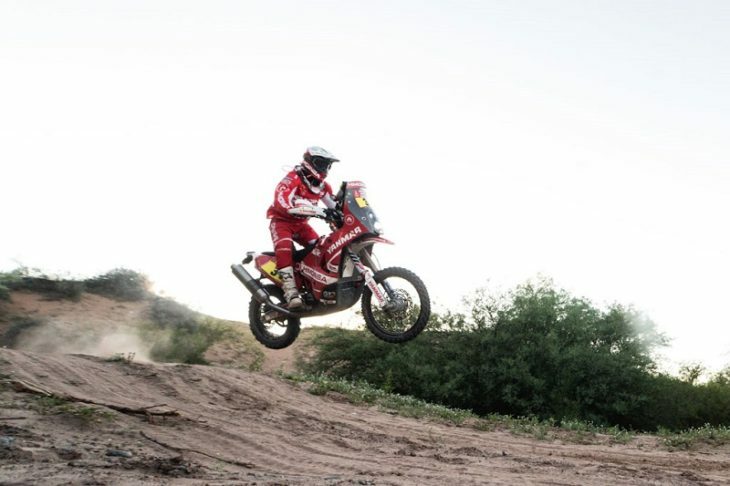 The rally’s last big drama was suffered by the Honda team with Ricky Brabec’s withdrawal after his engine caught fire, this and Cornejo stopping to help him favored several riders who advanced positions in the general. One of the beneficiaries was the HIMOINSA Team rider, Dani Oliveras, who is rewarded for his perseverance and good work in the race by entering the Top 10 on his own right. Marc Solà, still hurting after his crash in the marathon stage, suffered a lot in the stage without being able to ride at his best, but even so he set very good times, which prove the potential of the Catalanrider. Iván Cervantes, who after his wheel issue in the previous stage started in the back of the pack, had to make a comeback during the whole special. “Torito” overtook dozens of motorcycles and quads, with the difficulty and the extra danger of riding through a huge dust cloud.